by Martin Adams, Ph.D., Article donated by the mane points horse resource center. We don't fully understand why some horses grow virtually indestructible hooves, while others are shelly and constantly prone to cracking. We do know some things about hoof growth, though, and can use this knowledge to influence its rate and quality. Hoof horn is a highly modified, specialized form of skin. It has two main layers, the outer epidermis and the inner dermis, called the corium. The epidermis contains no blood vessels of its own; it obtains its oxygen and nutrients from the blood supply to the corium. that is very sturdy and resilient. Once these basal cells are infused with keratin, they become the flat, plate-like horn cells of the hoof wall. The amount of keratin in hooves can vary, one of the factors that determines how tough the hoof horn is. Keratin-containing cells arrange themselves in long tubules which, in turn, arrange themselves in a spiral that acts like a spring. The tubules deform, then bounce back when the horse bears weight on each foot, providing a natural cushioning effect similar to a human's high-tech running shoes. The hoof wall of a normal adult horse grows at a rate of 1/4 inch or more per month. At the toe, it will take nine to 12 months for hoof horn to grow from the coronary band to the ground surface. Many factors can affect hoof growth, including genetics, overall health, exercise, environmental temperature, moisture and nutrition. Some breeds--Arabians and some ponies--are well-known for high-quality, hard hooves; others, especially thoroughbreds, are known for having poor-quality feet. Cold and extremely dry weather slow hoof growth. High body temperature might retard hoof growth. When a horse is in training, its metabolic rate--and hoof growth--increase. Since many dietary needs must be met in order for the horse to grow a good-quality hoof, nutrition plays a big role. Deprived of nutrients, the hoof grows more slowly, and the horn that is produced will not be able to do its job while maintaining its integrity. The best approach includes using a premium feed. Horses that are not fed adequate calories will have a reduced rate of hoof growth. Horses that are fed too little protein will have slowed hoof growth and poor-quality horn that is prone to cracking. Horses fed calcium-deficient diets have slower rates of hoof growth and poor hoof quality. The best approach to insuring the proper nutrients for feeding the hoof includes using a premium horse feed (such as Legends or Triple Crown) that is fortified with the proper amounts of vitamins and minerals. Feed at the recommended rates. For example, most horse feeds have a minimum feeding level of .5 percent of body weight. Feeding less may not supply enough of the horse's required nutrients. If your horse can maintain proper body condition with less feed, consider using Triple Crown 12 percent Supplement or Triple Crown Lite. These have higher concentrations of vitamins and minerals and are designed for feeding at lower rates than you would with conventional feeds. Martin Adams, Ph.D., is publication director of The Mane Points. Biotin has received more attention in terms of hoof growth than any other nutrient. Biotin is a B-complex vitamin that is generally produced by bacterial growth in the horse's hindgut in sufficient amounts to meet nutritional needs. But some horses appear to benefit from supplemental biotin. Studies have shown increased hoof growth and improved hoof quality (less cracking) in horses supplemented with 15 to 60 mg of biotin per day. Methionine is an essential amino acid (meaning it must be provided in the diet), some of which is converted into cystine in the horse's tissues. Both methionine and cystine contain sulfur, which is an essential element in the formation of keratin. Supplementing methionine, iodine and essential fatty acids (linoleic and linolenic acids) has improved hoof quality in horses and cattle. Organic forms of zinc (zinc molecules attached to amino acids), which are more readily absorbed than inorganic forms, have also been shown to increase the rate of hoof growth and hoof wall density when added to the horse's diet. If you have a horse with a history of poor hoof condition, use a supplement that contains biotin (at least 20 mg per daily dose) in addition to iodine, organic zinc and methionine. Since each of these nutrients has resulted in improving hoof quality, there may be some synergies in providing them all in one supplement. There are several such hoof supplements on the market. Still, it may take nine months or more to see a marked improvement. 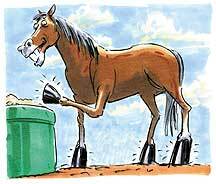 Read the next horse shoes article on Horse Hoof Injuries.